We had an early start on the garden this year, thanks to my hubby who worked non-stop prepping it as soon as the last frost slipped back to winterland. With an early start, the garden has already started producing, and we have reaped it’s bounty. This is one of its early risers, beets! I just couldn’t wait to have a sample so these roots were simply boiled unadorned served with some early collard and beet greens in gata (coconut milk). Below is a photo of the gardener’s lunch, taken of course out in the garden. We love eating outside especially now that the weather is nice but not so hot yet. 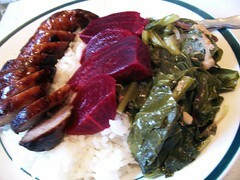 Hubby has to have some meat, so with his beets, he had some grilled italian sausage. Hi stel! oh yes, do try it it really does taste like laing. That is what I was going for ever since I saw the laing post on Ting’s and Sassy’s post. I loved the texture, just like the real thing. hi J! ooh we love collard greens so much so i have to try it this way. looks almost like a laing version! Hi Chas, it is as yummy as it looks. Fresh from the garden, it has a slightly earthy but sweet taste. Earthy the way potato is, but has a sweetness like a turnip root for instance. I just love the color, except it turns your whole mouth red 🙂 my daughter uses it to color her lips like lipstick! lol! The greens (leaves) taste almost like wild spinach. Delicious! BTW, do they eat borsht in Norway? I think you use beet in borsht, don’t you? I’ll have to look this up. 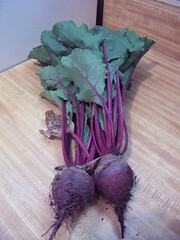 I havent tried beet yet. How does it taste like ? It looks yummy btw on your pics!